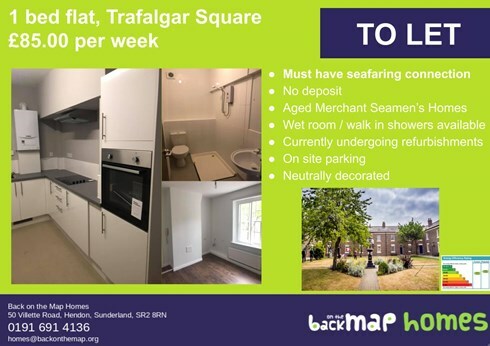 A number of 1 bedroom flats with walk in showers/wet rooms are available for rent in Trafalgar Square, Sunderland; some have been very recently refurbished the others are due to be refurbished in 2019. Applicants must have a connection to the sea, whether it be through a parent or husband/wife This can be from the Merchant Navy, fishing fleet to working in a port. Applicants must be over 50. Rent is £85 per week. The flats are managed by Back of the Map on behalf of Sunderland Aged Merchant Seaman’s Homes. For further information, please contact them on 0191 691 4136.